I was very, very nervous the night before I was to go away to college for the first time. Even though this was more than 45 years ago, I still remember how agitated I was. I had a recording of some of Bach’s organ music. The pieces that helped me the most were Toccata And Fugue In D Minor (before I saw the silent Lon Chaney version of The Phantom of the Opera) and Passacaglia And Fugue In C Minor. I turned up the volume so that the bass notes vibrated my body. I hummed the low notes along with the organ. This was very soothing and helped me to breathe. I listened to this same record as I inked and painted the composition above. My approach to representation was to treat the music as it were a collection of parallel lines, each with its own rhythm and pitch, treating the paper as if it was a musical score. This treatment is very unsophisticated. Painters such as Paul Klee and Vasilly Kandinsky, who had deep understanding of music, were able somehow to translate musical concepts such as harmony, counterpoint, fugue to the visual domain with more than just a collection of vibrating lines. That music-to-vision connection eludes me for the moment. 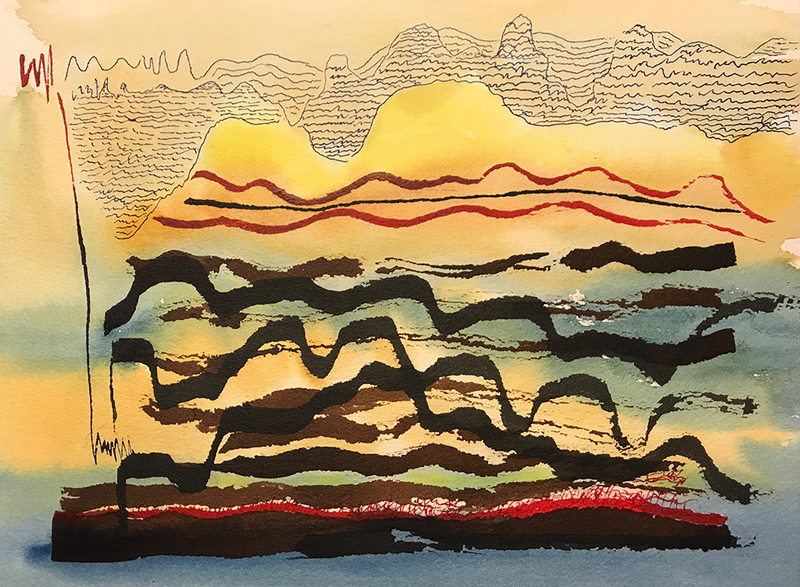 This entry was posted in Personal Stories and tagged abstract art, artistic process, comfort, music, Paul Klee, Toccata and Fugue in D Minor, visual arts, visual representation of sound, Wassily Kandinsky, watercolor. Bookmark the permalink.